Who will win? 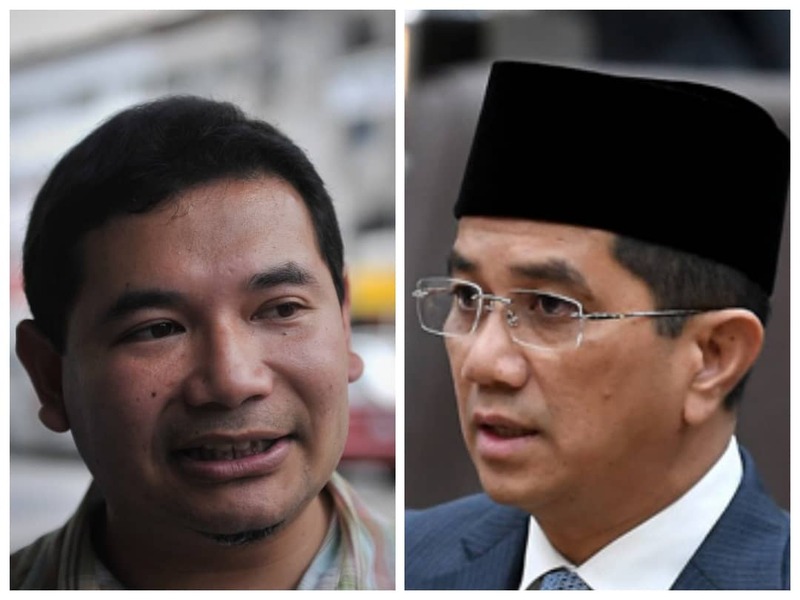 Rafizi’s (left) and Azmin’s (right) showdown will hinge on the validity of the membership list of the PKR Julau branch. THE last leg of the Parti Keadilan Rakyat (PKR) election which started on Sep 22 will begin in Sarawak tomorrow. Inevitably the centre of attention in the two-day state election will be the partys Julau branch where the controversy over the astronomical rise in membership from 603 on June, 26 to 13,000 the next day has yet to be resolved. That super surge of membership in Julau can potentially create an upset in the race for the deputy president post between Datuk Seri Azmin Ali and Rafizi Ramli. Azmin the pre-race favourite is leading with an uncomfortable margin of over 3000 votes but with the PKR Julau chairman Larry Sng openly declaring his support for Rafizi the surge in membership in that branch has set off the alarm bells in Azmins camp. Azmins lead would be wiped out by Sngs men in Julau as the election is based on one member one vote. Azmins people have lodge several reports with the MACC against the dubious overnight registration of the more than 12,000 members. There were also police made by those whose names appeared in the list without their consent. The MACC and police investigations over the issue are still on-going and more dirt was dug up in recent days but incredibly, the partys central leadership announced in a statement released on Nov 8 that the new membership list of the Julau branch is valid. This led to the belief that the top leadership in PKR wants the Julau membership list to go through to help Rafizi win the deputy president contest, which is a credible conclusion as PKR president Datuk Seri Anwar Ibrahim has openly endorsed Rafizi as the candidate for the deputy president post. On the other hand Pakatan Harapan (PH) leader Tun Dr Mahathir Mohamad has made it clear he prefers Azmin to be the PKR deputy president. So in reality the contest for deputy president post is a tussle between Dr Mahathir and Anwar which could decide who would be the next prime minister of Malaysia. On the surface the PH leadership succession plan has been decided with Dr Mahathir helming the government for two years before letting Anwar take over. But in politics there are always undercurrents of intrigues and the inevitable clash of personalities. On their own, Dr Mahathir and Anwar might be able to see through the transition of power but there are powerful personalities in both camps who have ambitions of their own and old scores to settle. Pakatan Harapan is actually a coalition of erstwhile enemies and while they were willing to bury the hatchet to oust Barisan Nasional from power in the last general election, keeping their peace when they are in power is another kettle of fish. Anwar seemed to have allayed fears that he would upset the arrangement when he told PKR elected representatives after his release from the prison, I dont want any party leaders to raise the issue that I will take over in two years time because by raising the issue you will be making Mahathir a lame duck Prime Minister. I know after two, or may two and half years, I will take over. However, one observer claimed that Anwar was singing a different tune to the party members later when he seemed to indicate he is in a hurry to take over from Dr Mahathir when he said , I want to take time to be with my family, to look after my health, I want to take two or three months on my lecture tour. When I come back, I want to inherit a strong party. Even if Anwar is willing to wait his turn, his supporters in the party might not have the same patience as they worry that the grand old man might have trick or two up his sleeves. It is an open secret among PKR top leaders that Anwar most trusted inner circle are Rafizi Ramli, Dr Rahim Ghouse, Datuk Johari Abdul and Datuk Saifuddin Nasution. These are the four who are very often seen around him. Some political observers believed that UMNO is trying to destabilise PKR by planting in the mind of the four leaders that Dr Mahathir and his right hand man Tun Daim Zainuddin are planning to use this waiting period to bring down Anwar from the top PKR leadership and prevent him from becoming the prime minister. Given the long history of bitter feuds between Anwar and Daim, the conspiracy theory cannot be dismissed offhand. To see through his plan the conspiracy theorists said Mahathir is grooming Azmin to over him once he disposed of Anwar. To thwart Dr Mahathirs plan, Anwars camp is putting up Rafizi to challenge Azmin for the deputy president post thus making the contest for the number two post in PKR a proxy war between Mahathir and Anwar. The outcome of this chess game between the two top PH leaders could hinge on the validity of the membership list of PKR Julau branch.